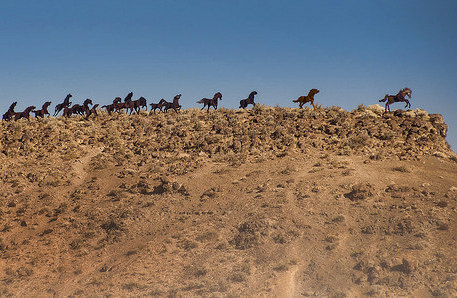 The road sign calls it Wild Horses Monument, but the real name of this artwork is Grandfather Cuts Loose the Ponies. And despite being begun in 1989, it’s still not complete! The sculpture was designed and created by Chewelah sculptor David Govedare. He envisioned a 36-foot tall woven basket made of steel, tipped up by Grandfather (a symbol of the Great Spirit), to allow the 18 horses within to run free.